Members of the workshop held in Bahir-Dar, Ethiopia June 27-28, 2015. 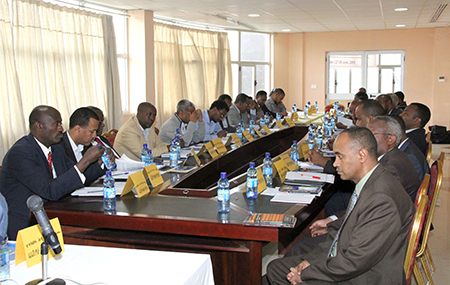 The Forum of Federations, in collaboration with Ethiopia’s House of Federation, held a workshop titled “Intergovernmental Fiscal Transfer Systems and Practices in Ethiopia” in Bahir-Dar, Ethiopia June 27-28, 2015. The workshop was attended by 34 officials and experts from both federal and regional state institutions, including the House of Federation’s Standing Committees Chairs and Secretaries, representatives from Ministry of Finance and Economic Development (MoFED), Custom and Revenue Authority, Central Statistical Agency, National Planning Commission, as well as regional Bureaus of Finance and Economic Development (BoFED) and Revenue Authorities from all the regions as well as the Addis Ababa University’s Centre for Federal Studies, the Forum of Federations and experts from the House of Federation Secretariat. The first day of the workshop was opened by Amhara Regional State Vice-president, Honorable Benalfe Andualam and the Forum of Federations East Africa Director Mr Maeregu Habtemariam. In his opening remarks the Vice-president emphasized his government’s support for such a timely agenda of discussions on the country’s revenue sharing and grant formula practices. A background paper on the theoretical underpinnings and international experiences of revenue sharing was presented by Dr Zewedu Kebede, the House of Federation Secretariat’s Senior Fiscal Transfer Expert. The discussion was moderated by Dr Assefa Fisseha, Director of Center for Federal Studies, Addis Ababa University. Dr Zewedu briefly presented the theoretical principles of revenue sharing in federal systems. He also explained practices in Canada, Germany, India and Nigeria as examples. After thoroughly reviewing the Ethiopian context against the theoretical underpinnings and practices in other federations, participants identified major gaps related to legal framework, institutional arrangements, sharing formula and administrative matters. The workshop recommended key interventions in the short-, medium- and long-terms. Strengthening coordination between stakeholders through creating formal forums is one of the major recommendations to be addressed in the short-term. In the medium-term the country needs to improve and update the existing revenue sharing formula taking into account best practices. Establishing coordinated systems between the revenue sharing and other federal transfers, ensuring accessibility and transparency of revenue sharing, tax collection and administration were also recommended. The long-term recommendations focused on revision of the legal framework. 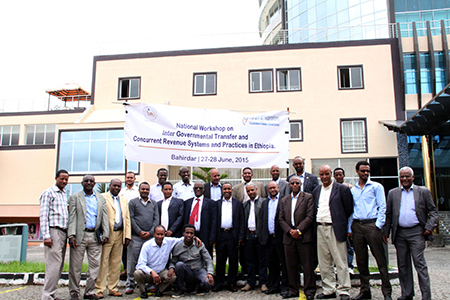 The second day was devoted to details of the intergovernmental fiscal transfer system in Ethiopia. The discussion was based on Anwar Shah’s recent comprehensive assessment of the Ethiopian intergovernmental transfer system. 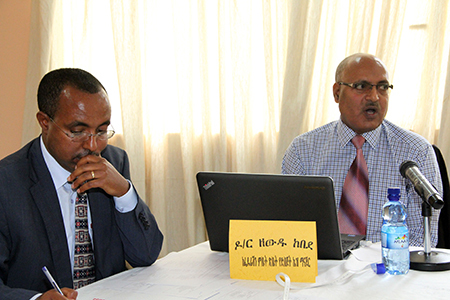 Anwar Shah’s assessment report was presented to the workshop by Dr Zewedu Kebede. The session was moderated by Ato Worku Adamu, House of Federation, Concurrent Revenue and Budget Subsidy Allocation Standing Committee Secretary and Ato Debebe Barud, House of Federation Secretariat General Director. Shah’s review has identified key strengths and weaknesses of the system. According to Shah the Ethiopian block grant formula has the following strengths: its intention of addressing both the vertical and horizontal imbalance, its consideration of capital and recurrent expenditure as well as revenue potential of regions, its engagement of stakeholders, its consideration of regions’ disability factors, its predictability, the wide political consensus on the formula, and its usage of objective criteria and indicators. Shah also identified key weaknesses, such as: the volatility of the resource pool allocated for the block grant transfer, the lack of relationship between the calculated fiscal gap and resource envelope, the use of representative tax systems, the lack of coordination between the MDG grants and other specific grants with the block grant transfer formula, the lack of conceptual clarity in the expenditure need estimation, poor accountability mechanisms, its reinforcement on the regions’ revenue dependence on the federal block grant, among others. Shah has presented recommendations both short-term (simple and gap filling), but with an eye on long-term change aimed at promoting regional autonomy and equity. Participants have argued strongly for and against the findings and recommendations of Shah. The participants have appreciated the initiative of the House of Federation to review the system using well reputed international experts such as Anwar Shah. They strongly recommended further detailed studies and consultations during the design, approval and implementation of the new grant formula to be in place from 2017 onwards. The Forum of Federations was given a strong message to collaborate in coordinating such efforts together with the House of Federation. The workshop was held within the Forum’s program “Strengthening Peace, Democracy and Good Governance in Ethiopia,” financed by the German Federal Foreign Office.